On Sept. 22, Syniverse’s Luxembourg office Employee Association held its second Sports Day, a special daylong event when everyone in our office participates in a number of sports activities to stay fit, have fun and raise funds for charities. This year, we built on the concept of our first Sports Day, in 2015, by recruiting some of our colleagues who are experts in different sports to serve as instructors for different classes. They joined some professional instructors who were on hand to lead an exciting seven-hour schedule of activities that included four classes, on yoga, karate, massage and muscle strengthening, along with two open activities, a cycling competition and a running discovery session, and a healthy lunch from a food truck. To our delight, we ended up drawing more colleagues and more donations to our selected charities than last year, and we succeeded in raising more than €4,200 euros (approximately $4,400) for our two selected charities this year. Our second Sports Day included a healthy lunch, four classes and two open activities that were a big hit with everyone who participated! For this question, I turn it over to Céline Dellis, a co-organizer of the event with me, president of our Luxembourg Employee Association, and Senior Product Management Director at Syniverse. Céline: In keeping with the theme of Sports Day, we decided to select two charities that were sports-related and that were local and making a difference right here in our community. The first was Sportunity, a Luxembourg-based organization that helps talented young athletes from low-income households get the extra support they need to pursue a career in sports, and helps implement community programs to encourage young people facing difficult life situations to participate in sports. 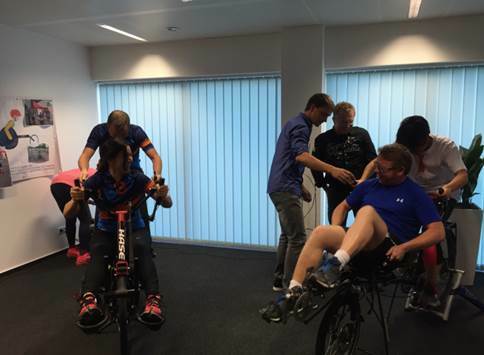 The second charity was Back to Sport, another Luxembourg-based organization that helps children and adults with disabilities get involved in different sports, and each year selects three local sport events and coordinates the participation of disabled people in these events. Our donation to Back to Sport. Here to answer this is Danielle Palmyre, another co-organizer of the event with me, secretary of our Luxembourg office Employee Association, and Facilities Management Administrator at Syniverse. Danielle: In all, over 40 colleagues took part by joining at least one activity during the day. In particular, the colleague-led class for karate and the muscle strengthening class led by a professional coach built a lot of excitement that helped attract a lot more people to participate this year. The original idea we had for our first Sports Day, last year, was as a time when we could focus on improving our well-being, taking part in a sports activity, and raising funds for charities. The 2015 event was such a success that we knew we would be inspired to build on it with a bigger event for 2016, and following this year’s success, we’re looking to include even more activities with new sports for colleagues to try for a third Sports Day next year. What was the day like, and what was one of the highlights? 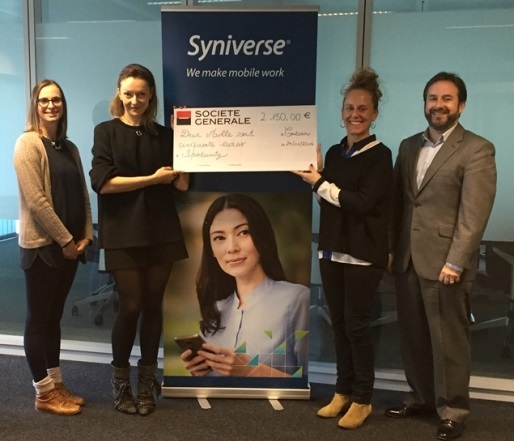 I leave the answer to this question to Martine Saunier, another co-organizer of the event with me, a member of our Luxembourg office Employee Association, and Customer Service Specialist at Syniverse. Martine: We were led through a set of activities for classes in yoga, karate, massage and muscle strengthening, and we also competed in two open activities that included a cycling challenge and a running discovery session. The cycling challenge was definitely one of the highlights and drew over 30 people to participate in three-minute competitions that represented one of our most popular events of the day. Since one of the goals of the charities we were supporting is helping disabled people participate more actively in sports, we came up with the idea to use one of the charity’s special tandem bikes, which is designed to allow two people to pedal together. One person pedals with their feet while the other person pedals with their hands. We predicted that this unconventional setup would pique everyone’s curiosity, and, indeed, almost all participants were drawn to take part in the cycling challenge. At the end of this competition, we were all out of breath and totally exhausted, but we were much more enlightened about some of the physical challenges that a disabled person faces. 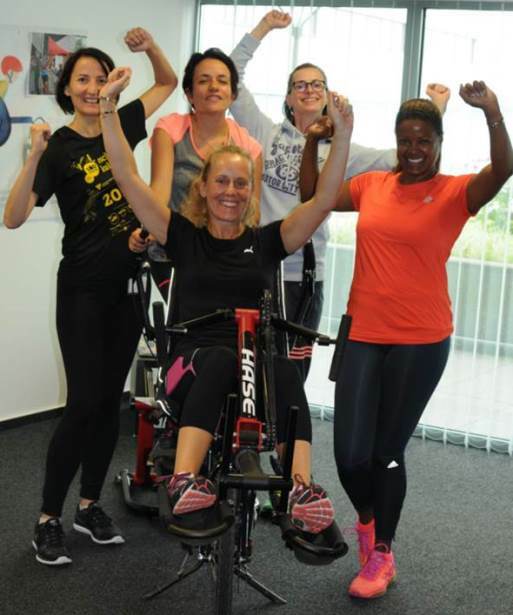 The organizers of Sports Day pose by the tandem bike: (from left) Martine Saunier; Annabelle Rollot; Céline Dellis (on bike); Sara Benzeno, member of Luxembourg office Employee Association and Executive Assistant); and Danielle Palmyre. The most rewarding moment of the day for me was the cycling challenge. We gathered in teams and had to cycle as fast as we could for an exciting three minutes. The popularity of this activity helped us double last year’s donation, and we are overjoyed about this achievement! Here are some more thoughts from my co-leaders. Céline: My most rewarding moment was seeing so many of the employees gather around the cycling challenge and cheer on the participants. Danielle: The most rewarding thing for me was really seeing everyone join in the activities and have such a great time together. Martine: The most rewarding moment for me? 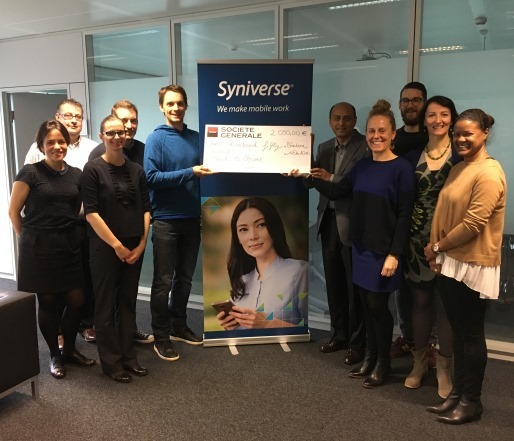 When the donation forms were returned and we realized that we significantly increased the amount of our contributions from the year before, and that a majority of our colleagues in the office made a donation to one or both of the charities. It was inspiring! Our cycling challenge in action. Annabelle Rollot is a former Senior Campaign Specialist at Syniverse.